HITMAN Termite & Pest Control concentrates on educating you, the home owner, on the IPM process and how eliminating the sources of these elements will help your home become a less desirable destination for pests. IPM greatly reduces the likelihood of a pest infestation and provides a better living environment for you and your family. Clean up spills & crumbs immediately. Empty house hold garbage on a regular basis. Store garbage outside in clean, sealed containers. Don’t leave dirty dishes in sink over night. Don’t leave pet food in dishes over night. Limit eating to kitchen and dining room areas. Keep kitchen clean and grease free. Move and clean behind large appliances. Fix faulty gutters and down spouts. Unclog all gutters and drainage systems. Direct all surface water away from structure. Eliminate all standing water on property. Repair faulty roofs and chimney flashing. Fix clogged or slow running drains & leaky faucets. Repair all leaking pipes and drains within the home. Empty water trays under potted plants. Check children’s toys and yard furniture for water collection. Caulk all door & window frames. Install vapor barriers in dirt basements & crawl spaces. Install LEAF DEFIER gutter protection system. Remove or repair all sick or dying trees. Trim large tree limbs away from house, at least 12′ clearance. Remove all tree stumps & wood debris. Remove all compost or brush piles. Store firewood far away from house, up off ground, covered and dry. Trim all ornamental shrubs away from house, at least 2′ clearance. Keep lawn mowed regularly and eliminate overgrowth. Trim all vines & ground cover away from siding & foundation. Fence or seal any access below at-grade decks. Caulk all window & door frames, seal cracks in foundations. Repair & Screen all attic & crawl space vents. Eliminate all wood to soil contacts, maintain 6″-8″ of exposed foundation. Seal all openings around pipe, conduit, A/C line, and cable & phone lines. Repair or replace all rotted wooden members; decks, RR ties, sill plates, window & door frames. Install CHIMNEY CAPS on all exposed flues. The professional service technicians and management staff at HITMAN Termite & Pest Control are extensively trained to search out the hiding places and conducive conditions of structural pests as well as determine what type of pests have invaded your home. They will provide you with specific suggestions for a program that controls and monitors these pests using IPM control techniques that are designed with your family’s health and concern in mind. Ask us about our HOME PROTECTION PLAN, it is the best way to protect your family, your home and to provide a more enjoyable living environment for everyone. Ask about our Home Protection Plan, this is the best protection we can provide to control pests in and around your home. 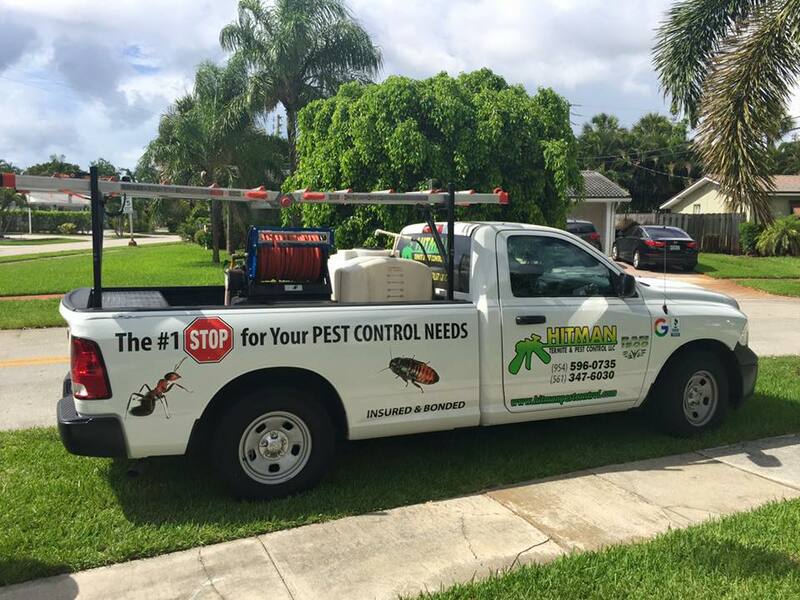 Pests are a constant threat to your home environment and with on-going inspection, treatment and correction of conducive conditions, HITMAN Termite & Pest Control can provide a much better living environment for you and your family.